The earth rotates around the sun for 365 days a year, so it's only fitting we take time out to celebrate the place we all live on at least one of those days. The earth rotates around the sun for 365 days a year, so it's only fitting we take time out to celebrate the place we all live on at least one of those days. Earth Day, launched on April 22, 1970, is upon us again, and so, as a way of saying thanks to our home planet, we're looking back at some of the gowns and ensembles in the Valentino archive that were inspired by that never-ending inspiration, nature. Flowers have always been a key motif for Valentino. Though the maestro used floral prints very selectively over the course of his career, he found other ways to create stunning bouquets. Notably, some of his most extraordinary couture creations feature the sculpted rosette—for instance, the ombre red gown from HC Spring/Summer 2003, with its skirt and long train of pleated, crystal-embellished roses, and the pale pink showstopper from HC Spring/Summer 2008, with deep pink rosettes bursting through the tiers of silk voile. Of course, there have been floral prints, too—to wit, the poppy and wheat stalk-printed organza gown from HC Spring/Summer 1971, a look that feels especially timely given fashion's current pastoral mood. But even this seemingly simple dress has a 3D element that marks it as a Valentino work: Both the dress and its accompanying hat are accessorized with bouquets of silk poppies and preserved threads of wheat. If flora was a key theme of Mr. Valentino's, so too was fauna. Several of his most famous looks feature animal prints, and not just the expected leopard spots. 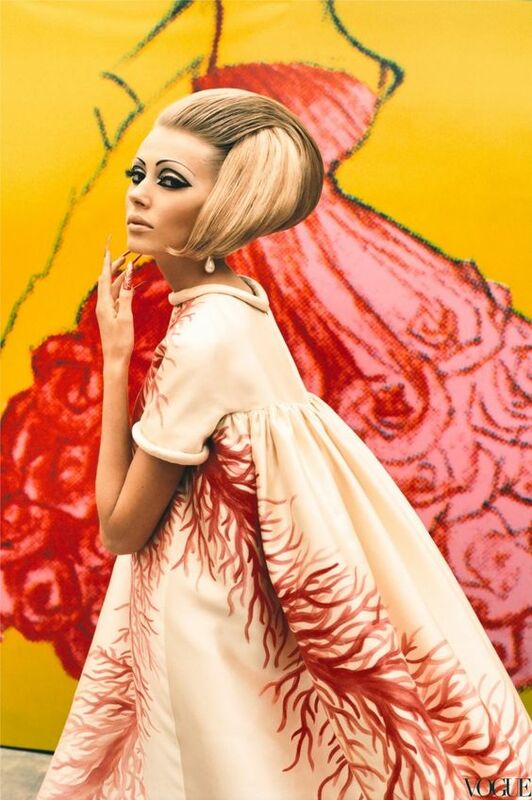 A crop top and palazzo pant evening ensemble from 1966 was printed in zebra stripe; his iconic back-draped ivory silk gown from 1968 was finished with a pattern of hand-painted coral. As witnessed by the shot of the gown by Ruven Afanador, the look is as fresh today as it was fifty years ago (or in the year 2000, when the picture was snapped.) Other animals have made their way into the Valentino menagerie as well—snakes come via the metal jewelry on belts, while birds make frequent appearances via feather embellishment. Mr. Valentino understood that getting in touch with nature didn't require a sacrifice in glamour, because nature possesses its own glamour, too.